Tonale / Ponte di Legno / Presena - the ideal combination of ski terrain for all demands, creating a common interlinked ski resort suitable for everyone, wide plan for families with children, but their will come and glacial fan proficient or camper. High Pass area - the guarantee of snow. The recently built Hotel Sport Vittoria is located in the center of Passo Tonale near shops and restaurants. The newly renovated Hotel Delle Alpi is located in the resort of Passo Tonale just a few steps from the slopes, lifts and center with shops and restaurants. 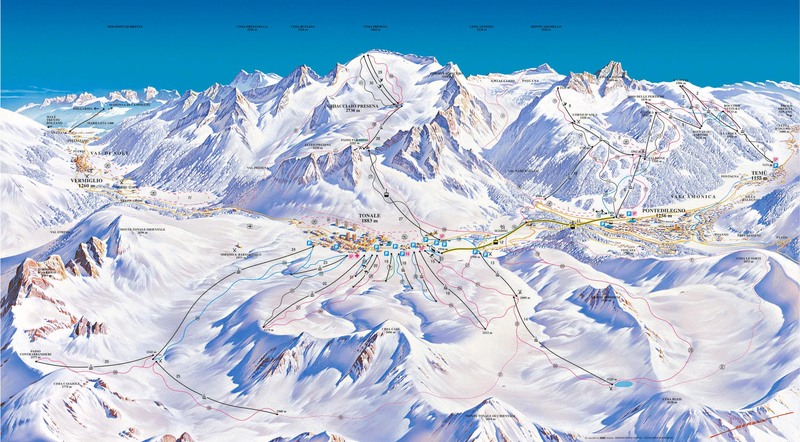 The Hotel Eden is near the Tonale resort, about 200m from the center and close to the lifts. Altitude 1883 m. Pharmacy 100m. Hotel Bezzi has an optimal location in the valley Tonale is located 1 km from Passo Tonale and 8 km from Ponte di Legno. Orchidea, family run hotel is situated in a sunny and quiet location near the center of Tonale resort with shops, restaurants and bars. Pharmacy 150m. Hotel Sciatori is situated in the center of Tonale resort with bars, restaurants and shops. Pharmacy 300m. Apartments "Fortuna" located in different apartment houses in Tonale resort at an altitude of 1884 meters. The hotel is located on Piandineve panoramic position overlooking the surrounding countryside at an altitude of 1883 m, 500 m from the center of Passo Tonale. The apartments and residences are located in the town Tonale (1 883 m). Residence Holiday Park is situated in a quiet location in the resort of Ponte di Legno (1.258mnm), about 400 meters from the city center. The recently renovated historic mansion complex and Palace aparthotel is surrounded by pine trees and lies about 600 meters from the center of Ponte di Legno at an altitude of 1250 meters. Renovated historical complex Aparthotel Residence Palace and is surrounded by pine trees and lies about 600 meters from the center of Ponte di Legno. Blu Hotel Acquaseria is located in the center of Ponte di Legno, about 500m from the center and near the slopes. Airport Bergamo Orio al Serio, about 120km. Completely renovated, family-led hotel Milano is situated in a typical mountain village Vermiglio in a peaceful environment in the mountains at an altitude of 1203 m.
On the plateau is a ski town full of hotels and residences for families who make up the majority of clients this ski resort in Val di Sole (Sun Valley). Dozens of lifts and seats for beginning skiers and small line the slightly inclined slopes in the area. The exception is the black Paradiso slope that leads from the Presena glacier (3.016 m), where well-tours savvy daddy-skier. Tonale - Ponte di Legno - Present among the best offer features such as skiing in Italy.